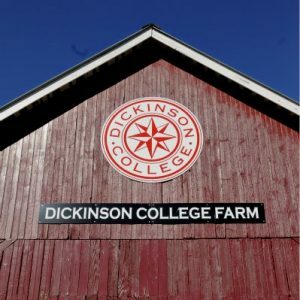 Dickinson’s College Farm is an eighty-acre, USDA-certified organic farm and a living laboratory where students can gain distinctive, hands-on learning experiences. Student employees, graduate apprentices and volunteers are involved in all aspects of food production and research. Students in a wide variety of disciplines learn about renewable energy and sustainable agriculture through workshops and volunteering opportunities. On-site classes and independent research projects give students unique insights into complex mathematics, the role of food in global politics, public art projects, Buddhist philosophies and more. The farm provides food to the campus and local community. 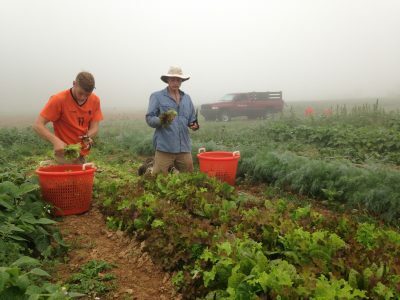 The majority of the harvest is sold to the campus Dining Hall, with a significant portion earmarked for the farm’s Campus Supported Agriculture (CSA) Program, a May-November produce subscription that feeds more than 155 members and their families. The farm also sells produce through a bountiful stand at Carlisle’s thriving weekly farmers’ market and donates thousands of pounds of fresh produce to a local food bank, Project S.H.A.R.E. Through youth programs such as Farm, Cook, Eat, Sustainable Earth Education (SEED) and the hosting of popular annual events such as the Local Food Dinner, Dickinson College Farm serves as a venue for the Dickinson community and its neighbors to experience a holistic approach to land stewardship rooted in management practices that work to sustain the natural environment.